*I’m putting chicken bouillon cubes on your grocery list. When you cook your rice to go with your Tilapia, throw that in there. The extra calories are negligible but it enhances the flavor a ton. For the Broccoli, you’re just going to steam it and add a little spray butter and salt. I don’t have a recipe for steamed broccoli. Calories include 1 cup steamed broccoli, and 160 calories worth of Rice. *For the Roasted Red Pepper and Swiss Stuffed chicken, You’re going to use the laughing cow garlic and herb instead of regular swiss that’s in the recipe. I’m doing this because the stuffed mushrooms also call for laughing cow, and this way you won’t have to buy 2 different types of laughing cow (it’s too expensive for all that, and combining these 2 recipes uses up a full container). I put this recipe together while trying to recreate a soup I’ve had many times at Izzy’s restaurant in Cinci. 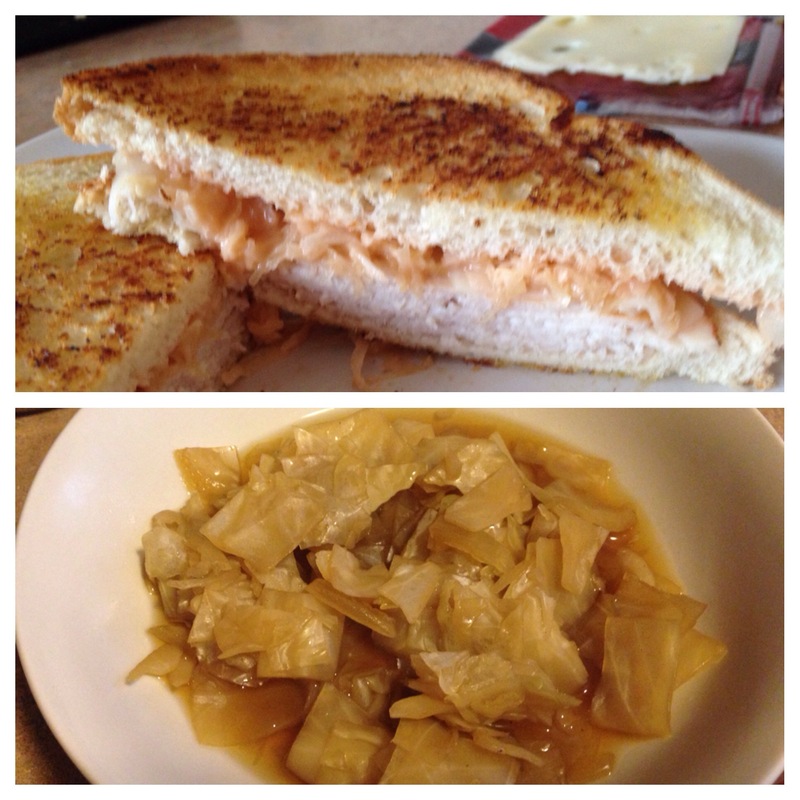 This goes nicely with the Turkey Reuben sandwich I posted yesterday, and combined they’re only about 300 calories! It’s a simple but yummy soup. I really enjoyed it, and if you like cabbage, I think you will too. Mix all ingredients together in a soup pot, and bring to a boil. Reduce heat to low and cook, covered for about 1 hour, stirring periodically. Note: I tried to make this in the crockpot and it didn’t really work. This one’s a stovetop soup for me going forward. Makes 6 cups of soup at only 42 Calories per cup! 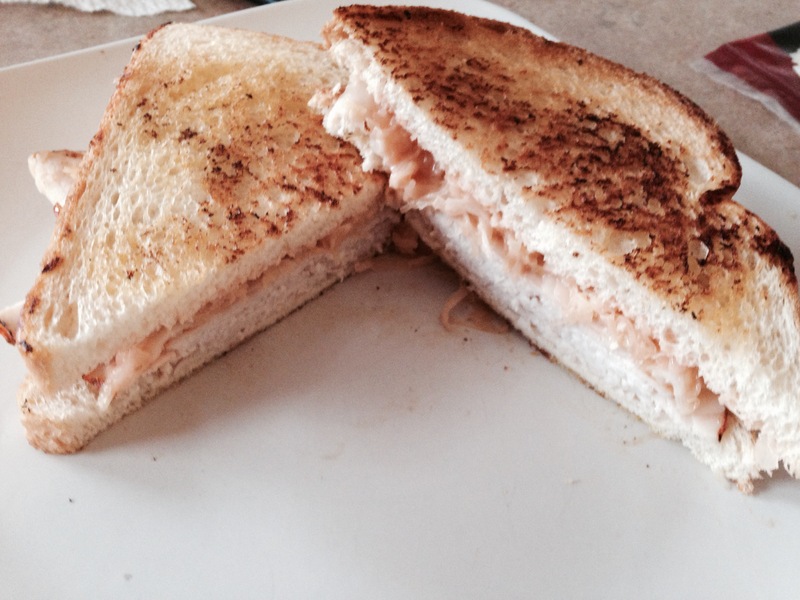 There were 4 of us eating dinner tonight, so, this recipe makes 4 sandwiches. You could adjust accordingly if you need more/less. Portion your turkey out into 3 oz portions. Spray 1 side of each piece of bread liberally with spray butter. 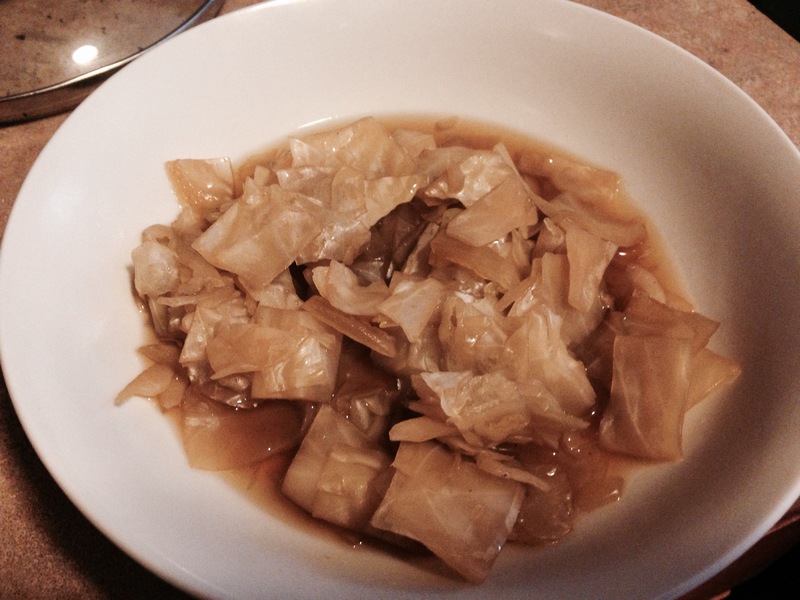 In a small bowl, mix your sauerkraut and thousand island together. Please each slice of bread butter size down in a large skillet or electric griddle to grill your bread. Spray the skillet or griddle with non-stick spray, and place each of your 3 0z portions of turkey in the skillet separately. 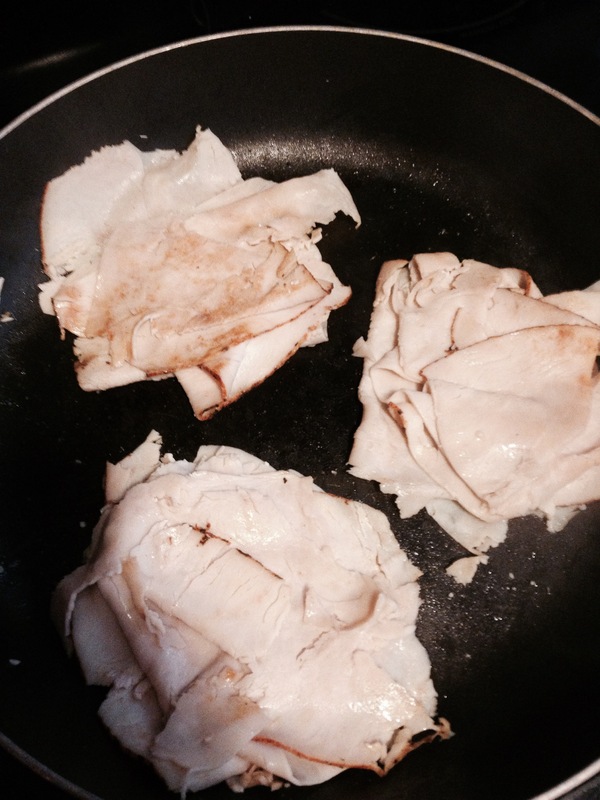 Cook each stack of turkey on one side, and then flip to cook on the other side. The idea is to warm the turkey through, not cook it crisp. Once your turkey is warmed, place a slice of cheese on top of each turkey portion and allow cheese to begin melting. Transfer each stack of turkey and cheese to a piece of “grilled side down” bread, and top each of the turkey portions evenly with sauerkraut mixture. 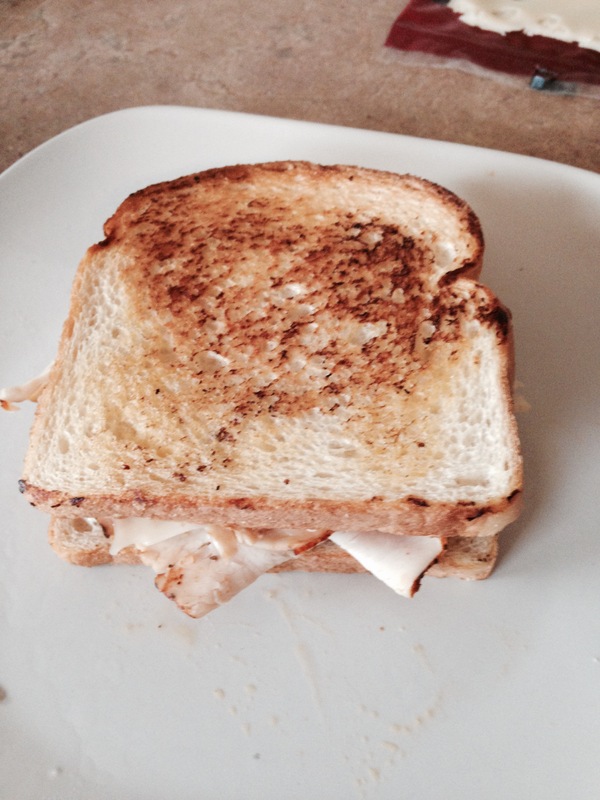 Top each sandwich with a remaining slice of grilled bread, grilled side up. 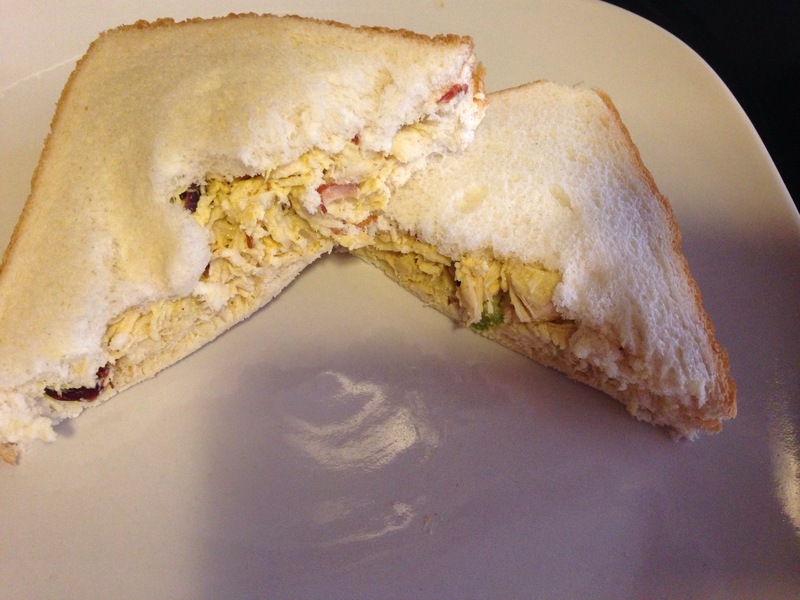 Slice sandwiches in half, and enjoy. My best friend’s Mom, who helped raise me when I was growing up, used to make Schnitzel, and it’s something I’ve always really liked, but only made a few times here and there. Last week I got a craving for Schnitzel and decided to try my had and a lower calorie version that would satisfy my craving, without too many calories. 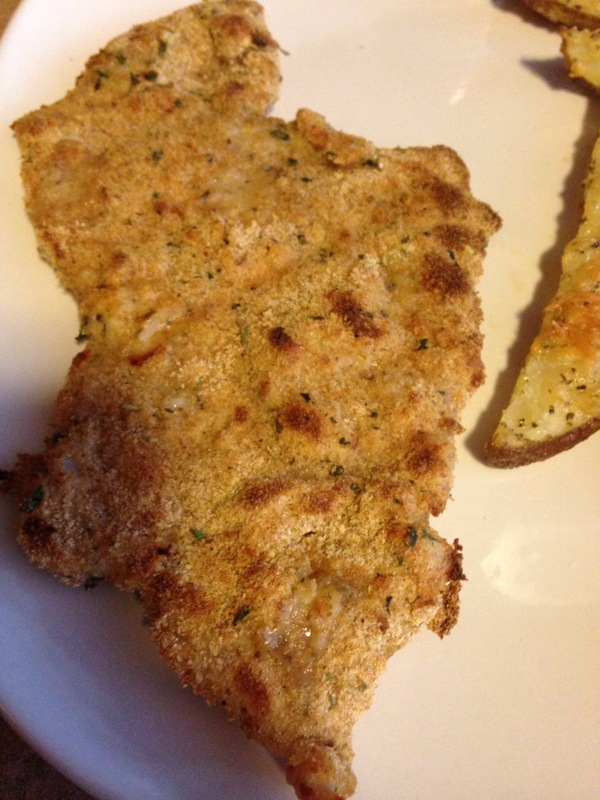 I like my Schnitzel with just a little lemon juice over the top, so that’s how we’re going to do it here! *Seasoned flour. I use it in all my savory dishes, and it makes a big difference. here’s the one I use, and you can even order it here if you are so inclined. Editor’s Note: Although the recipe calls for 1/2 cup flour and 1 cup breadcrumbs, and 2 eggs, I only counted calories for half this amount, because there was about half of each left at the end of prep. However, you don’t want to just start with half as much, because you won’t have a deep enough pile to properly cover your chops evenly. Place 1 chop at a time inside a large ziplock freezer bag. 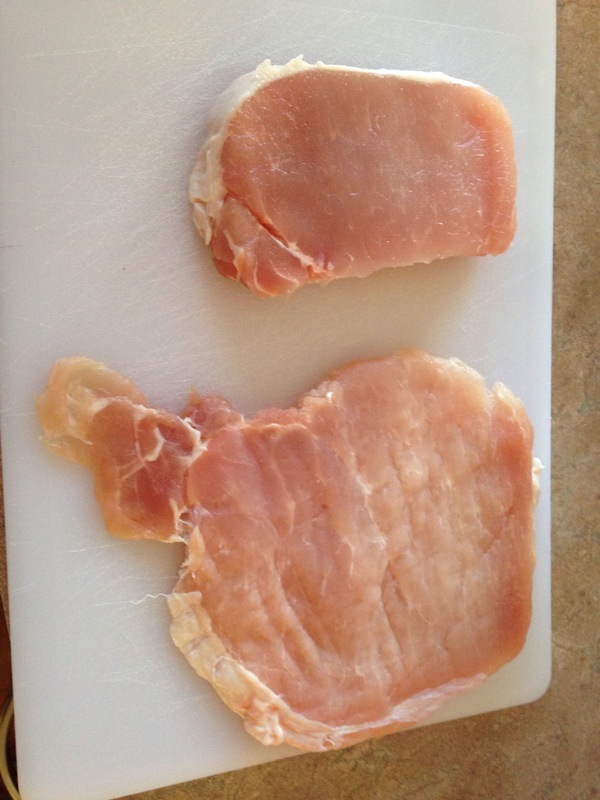 Use a meat mallot to pound the chop on both sides until the whole thing is flat and no more than 1/4 inch in thickness. The baggie keeps you from slinging pork-juice all over your kitchen. You could pound it out directly on a cutting board, but I wouldn’t recommend skipping that. Salt and pepper chops to taste. Using 3 shallow bowls, fill one with beaten egg, 1 with flour, and 1 with bread crumbs. Dip each Chop into the flour first, covering evenly, then into the Egg, and finally into the bread crumbs. 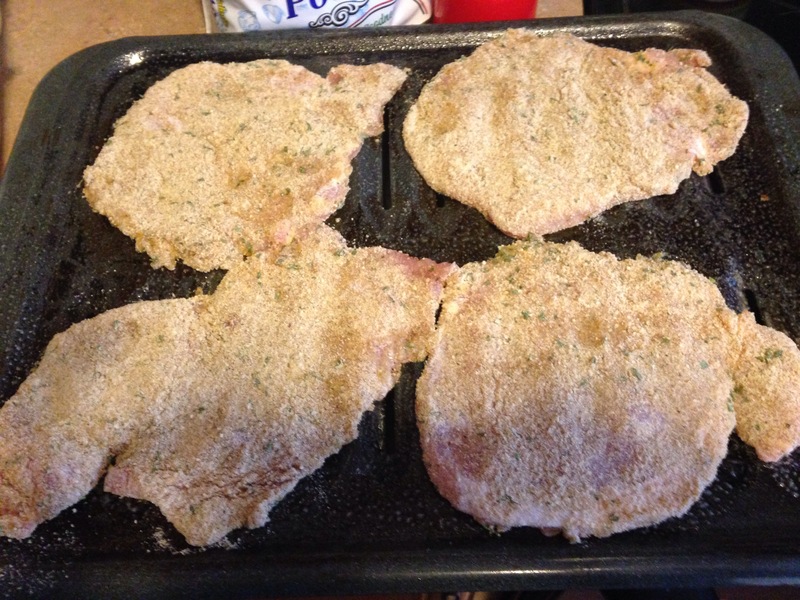 Once each chop is covered in crumbs, place them on a broiler pan, which has been sprayed with non stick cooking spray. Spray a light coating of non stick spray on the top of each chop, and Bake on 425 for about 15 minutes, then flip each piece of meat, and bake another 5 minutes. Broil briefly at the end if tops are not as brown as you like. Squeeze 1 slice (1/4 of a lemon) of lemon over each chop and serve immediately. 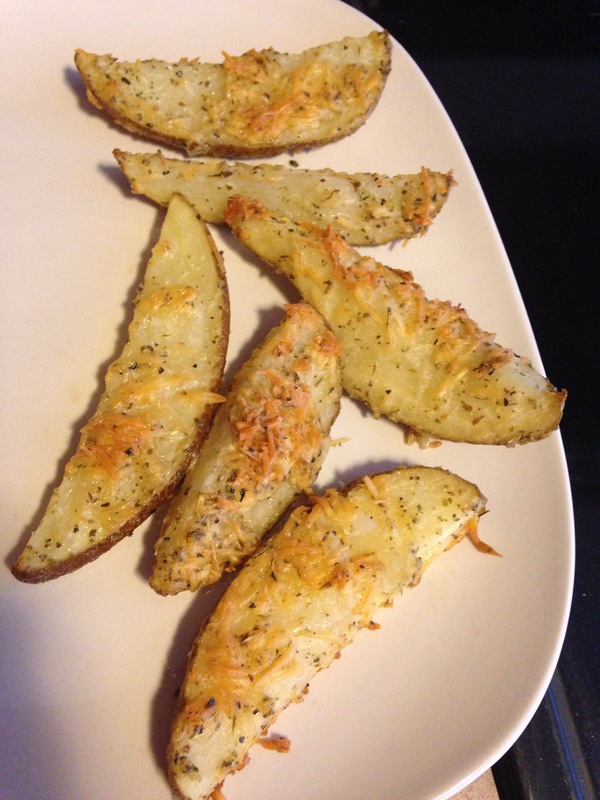 I altered this recipe from one that I found online, which had much higher calories. With just a couple tweaks of ingredients, it turned out both delicious and low calorie. I hope you enjoy. 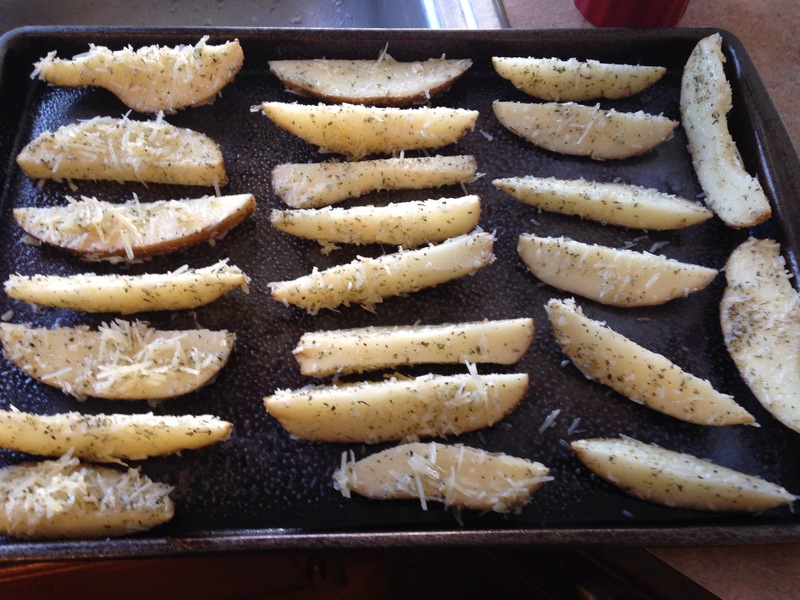 In a large bowl, cover the wedges with the olive oil, and stir it around so the oil coats all the potatoes evenly. Add all the seasonings as well as the cheese and mix well until all potatoes are covered. Spray a large baking sheet very liberally with nonstick spray. 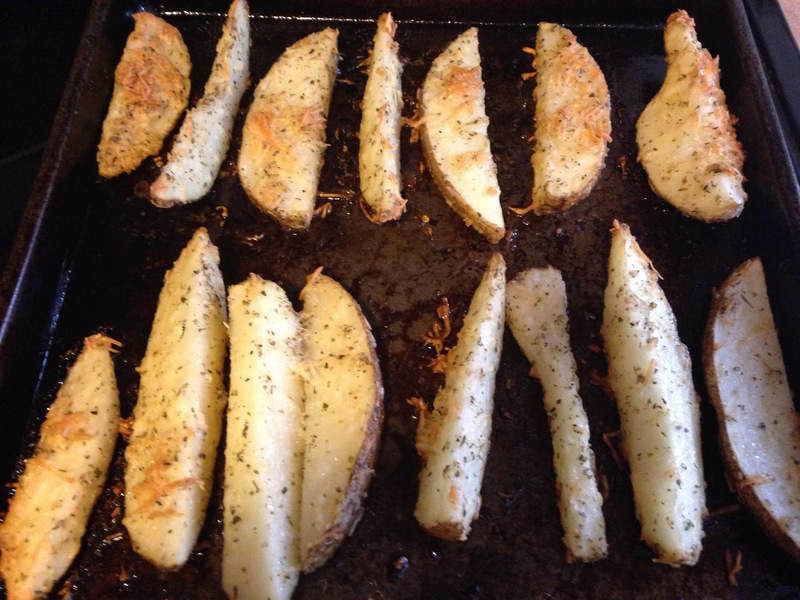 Line the wedges up side by side with the potato skills facing down on the sheet. Bake at 425 for 25-30 minutes. If you put them skin side down, you don’t even have to flip them during baking. This is a soup that I’ve only experienced from a can. Nobody in my family ever made anything with “Barley” in it. I wasn’t even sure what barley was until probably college… I knew it came in a can of vegetable beef soup, and that was about it. 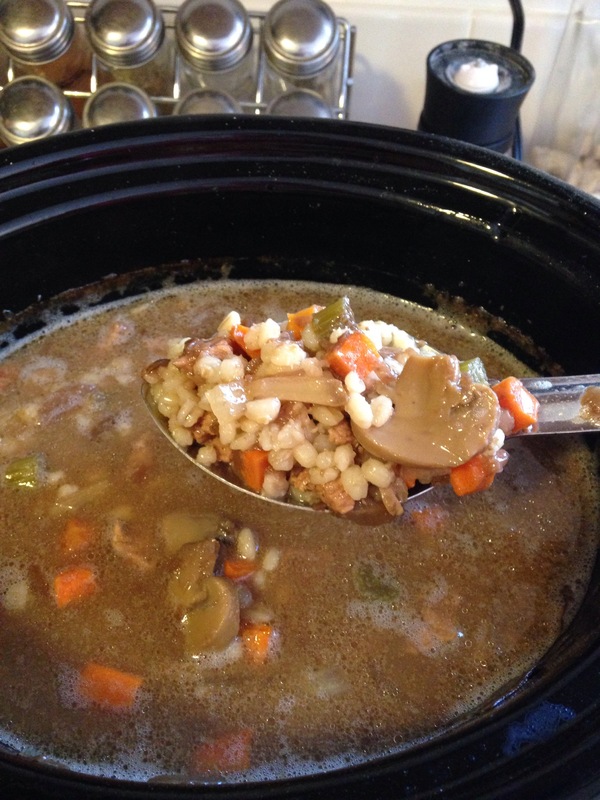 But for some reason the other day I thought to myself… self… “i’m gonna make beef and barley soup, and I already know what i want in the broth!” So, I set out throwing together ingredients, and I have to say I was pretty pleased with the results. Best part? This all cooked in the crock pot while I was 2 hours away at a baseball game. It’s about as low maintenance as you can get. My husband doesn’t enjoy soup, so I often share what I make with my neighbors. They gave it their official seal of approval, so here we go! The first thing I did was take the stew meat, which is already cubed into about 1 inch cubes, and i cut the pieces into 4’s. I wanted this soup to have lots of pieces of easy to chew beef, vs having big hunks of beef like a stew. Once you’ve cut your beef, place it in the bottom of the crock pot, and throw everything else right in on top of it. Stir the mixture around a couple times and then cook the whole thing for 8-10 hours on low. Hey guys! So, this recipe is an original that I threw together this weekend. It was inspired by a deli that used to be near my work, that sold Curry chicken salad on croissants. I loved the stuff, but the deli went out of business. 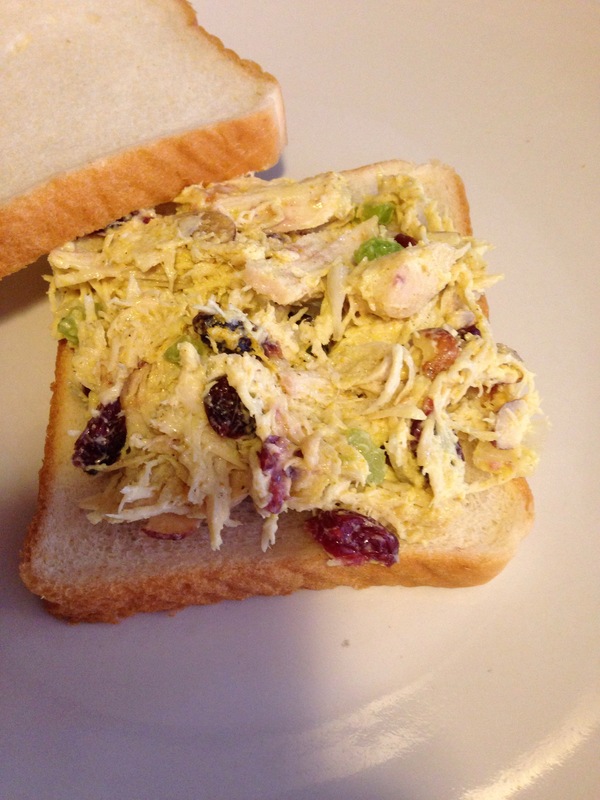 I hadn’t had curry chicken salad in years, but last week I got a craving for it, and so this low calorie version was born. I think this is delicious, and I will definitely be repeating it in my own household. Even the husband enjoyed it, although he was unsure about trying it at first. It’s yummy, and not too overwhelming with Curry. The sweet cherry craisins are a nice comliment to the curry flavor. I served this with 2 slices of 35 calorie bread (not included in the calorie count below). Mix everything but the chicken together first, to be sure your curry is mixed in well. Add chicken to mixture, and stir until everything is well incorporated. Serve with saltine crackers or low calorie bread. Add Lettuce and tomato if you like.